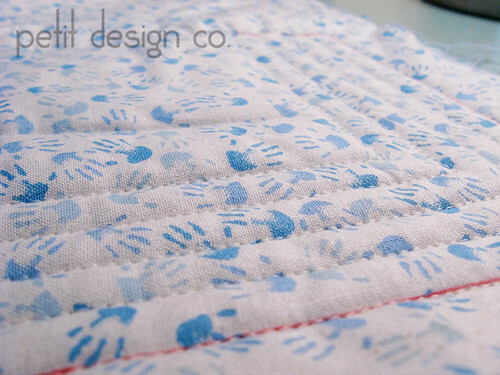 Today’s post might not be very interesting for those of you that have been quilting for a while. Feel free to skip out and come back tomorrow. I won’t be offended, I promise. I thought about skipping this post entirely but somewhere out there a newbie might stumble upon this post and I would love to get them started on the right path. I was a beginner once and I wish I had known then that there are always different ways to accomplish the same thing and that no one way is the right way to do things. It really doesn’t matter what kind of quilting you are doing, whether it’s free motion with a hopping foot or straight lines with a walking foot, you need to ensure that all your hard work doesn’t unravel over time. There are several ways to achieve this. 1) Back Stitch: To back stitch you stitch forward for a few stitches then using your reverse button you stitch backwards a few stitches. You will end up going forward again over your original stitches. I don’t really know if there is a set amount of stitches you are supposed to do, I usually stitch forward for 3 and back for 3, and then continue my stitching. I’ve never had anything come undone. Some people like to use it this method and some don’t. I tend to use this option only if I’m going to stitch a long line. If I’m stitching short segments where there will be a lot of cutting of threads I don’t like to use it because you will have that thicker section right at the beginning and end of your segment. 2) Knotting and Burying the Threads: Basically you do your quilting with out tacking and leave your threads long. When you are done quilting a section you hand tie a know and then use a needle to bury the knots into the quilt like you do in hand quilting. Some people do all of their quilting before burying threads.This is my least favorite method because I don’t like to have hanging/loose threads on my quilt while I am quilting. There is more chance for knots to form or threads to get caught inside the machine, plus I think it takes forever! 3) Shortening stitch length: One of the tactics form free motion quilting is to take a few small, tiny stiches almost in place at the beginning and at the end of your stitching line. 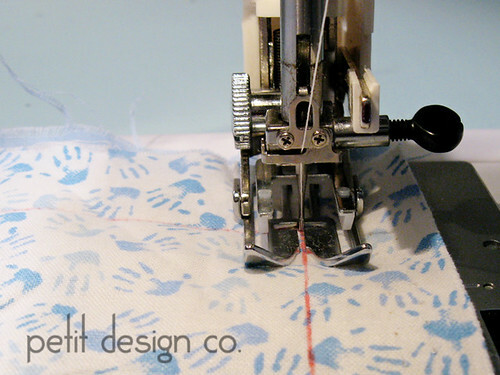 The same thing can be accomplished with the walking foot by manually manipulating the stitch length. I do this if I’m doing short segments of stitching and I don’t want the build up of thread to be so obvious from back stitching. I like this method better when I’m using a mechanical sewing machine, it’s faster to turn a dial than it is to push and hold a button on my computerized sewing machine. Make sure you tack your threads at the beginning. I used a backstitch. For this first pass I’m just following the red line right along the tiny opening in my walking foot. When I get to the end of the line, where it turns the corner I stop with the needle down. Sometimes you have to manually adjust your sandwich so that the needle goes down in just the perfect spot without going past the corner. To do this I use the hand wheel and adjust my needle to an almost down position, before it pierces the fabric (and right before that last stich takes past the corner.) Then I raise the presser foot and very carefully nudge the sandwich over to where the needle will be in just the right spot. Then I lower the needle completely right on the corner with the hand wheel. Now we are going to turn the corner. With the needle still down, raise your presser foot and carefully rotate the quilt sandwich 90 degrees and line it up in the new direction. 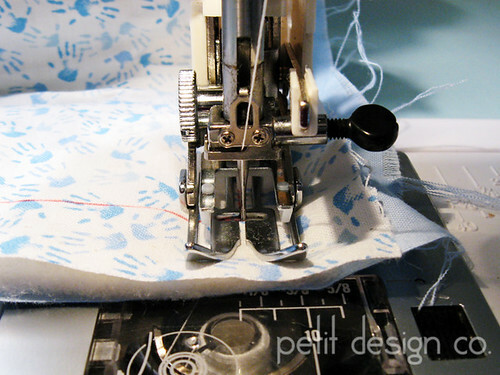 Lower your presser foot and continue sewing until you either finish or have to turn another corner. If you are finished don’t forget to tack your stitches at the end. Here is a picture of a few quilted L’s. For this example I used the edge of the walking foot as my guide and ended up with pretty narrow 1/4” rows. 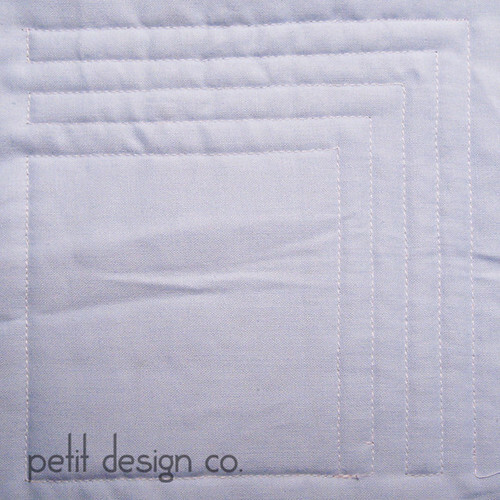 Just like in free motion quilting one of the best things you can possibly learn is how to minimize your starts and stops. They take time, and unless you’re burying your threads they tend to look messy especially if you have a lot of them. Learning how to travel in the ditch will help you with that. If you follow the path of the thread above (start at the lower right) you will see that the whole thing was quilted in one continuous line. At the very end I quilted the outer edges of the square which would have been in the ditch if this was a block in a quilt. Tomorrow I’ll show you a new design. Wow, that looks great. Thanks for the info today! Thank you again for these instructions. 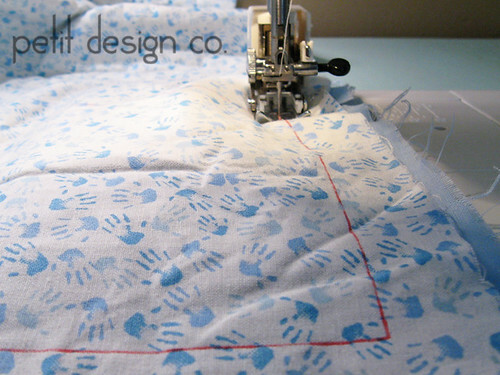 I have a couple of questions: What stitch length should you use when quilting stricht lines? And with the method of quilting were do you start, I am alway told or read that you start in the middle of a quilt and work outward? I like the idea of quilting L's. Do you try to do this with large quilts? I never would have thought that simply making L's would result in such a nice quilted pattern.